Barbecue season is back! I love making meatballs and burgers because they are a great way to experiment with new flavours for ground chicken or turkey. This recipe for burgers would also make a great meatball to bake in the oven when the weather is not warm enough for grilling. These burgers are high in protein and iron (21% of Recommended Daily Intake), and lower in sodium than frozen burgers. Note: In cold weather, these can be baked in the oven at 425 degrees F for 20-22 minutes. In a large bowl, combine all the ingredients for the patties and mix well with a spatula. Line a large baking sheet with tin foil. Grease hands with a small amount of coconut oil. Roll a tennis ball sized portion of the meat mixture into a ball, then place on the tin foil. Press the ball down into a flat patty the same size as the hamburger buns. Press the centre down slightly thinner than the outsides of the patty for even cooking. Grill patties until juices run clear. 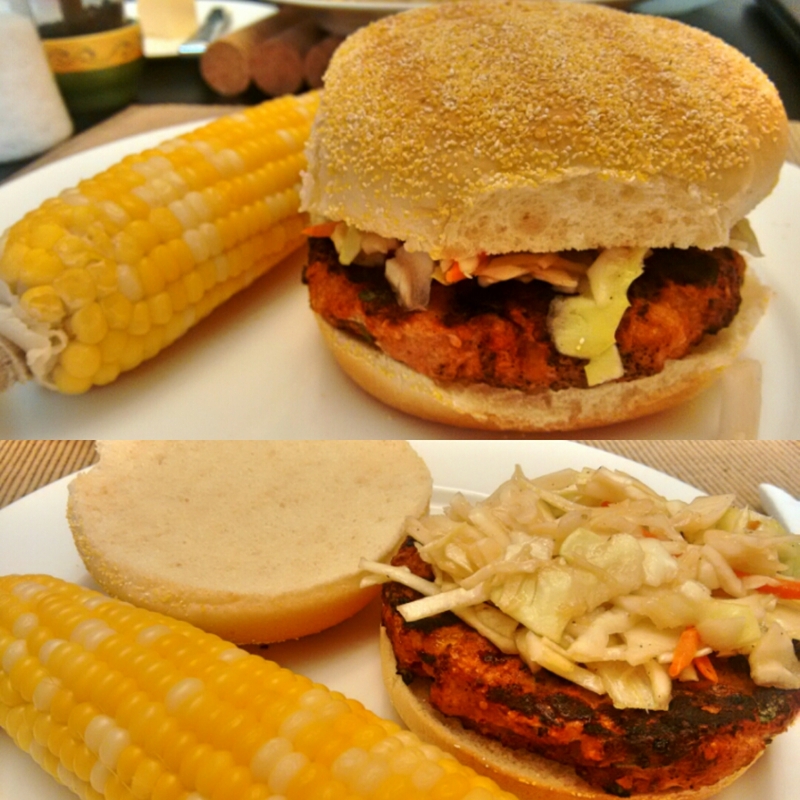 Place patties on hamburger buns and top with Sesame Ginger coleslaw and sriracha to taste.